The cathode-ray tube (CRT) is a vacuum tube that contains one or more electron guns and a phosphorescent screen, and is used to display images. It modulates, accelerates, and deflects electron beam(s) onto the screen to create the images. The images may represent electrical waveforms (oscilloscope), pictures (television, computer monitor), radar targets, or other phenomena. CRTs have also been used as memory devices, in which case the visible light emitted from the fluorescent material (if any) is not intended to have significant meaning to a visual observer (though the visible pattern on the tube face may cryptically represent the stored data). In television sets and computer monitors, the entire front area of the tube is scanned repetitively and systematically in a fixed pattern called a raster. An image is produced by controlling the intensity of each of the three electron beams, one for each additive primary color (red, green, and blue) with a video signal as a reference. In all modern CRT monitors and televisions, the beams are bent by magnetic deflection, a varying magnetic field generated by coils and driven by electronic circuits around the neck of the tube, although electrostatic deflection is commonly used in oscilloscopes, a type of electronic test instrument. A CRT is constructed from a glass envelope which is large, deep (i.e., long from front screen face to rear end), fairly heavy, and relatively fragile. The interior of a CRT is evacuated to approximately 0.01 pascals (9.9×10−8 atm) to 133 nanopascals (1.31×10−12 atm), evacuation being necessary to facilitate the free flight of electrons from the gun(s) to the tube's face. The fact that it is evacuated makes handling an intact CRT potentially dangerous due to the risk of breaking the tube and causing a violent implosion that can hurl shards of glass at great velocity. As a matter of safety, the face is typically made of thick lead glass so as to be highly shatter-resistant and to block most X-ray emissions, particularly if the CRT is used in a consumer product. Since the late 2000s, CRTs have been largely superseded by newer "flat panel" display technologies such as LCD, plasma display, and OLED displays, which in the case of LCD and OLED displays have lower manufacturing costs and power consumption, as well as significantly less weight and bulk. Flat panel displays can also be made in very large sizes; whereas 38 to 40 in (97 to 102 cm) was about the largest size of a CRT television, whereas flat panels are available in 82 in (210 cm) and even larger sizes. Cathode rays were discovered by Johann Wilhelm Hittorf in 1869 in primitive Crookes tubes. He observed that some unknown rays were emitted from the cathode (negative electrode) which could cast shadows on the glowing wall of the tube, indicating the rays were traveling in straight lines. In 1890, Arthur Schuster demonstrated cathode rays could be deflected by electric fields, and William Crookes showed they could be deflected by magnetic fields. In 1897, J. J. Thomson succeeded in measuring the mass of cathode rays, showing that they consisted of negatively charged particles smaller than atoms, the first "subatomic particles", which were later named electrons. The earliest version of the CRT was known as the "Braun tube", invented by the German physicist Ferdinand Braun in 1897. It was a cold-cathode diode, a modification of the Crookes tube with a phosphor-coated screen. The first cathode-ray tube to use a hot cathode was developed by John B. Johnson (who gave his name to the term Johnson noise) and Harry Weiner Weinhart of Western Electric, and became a commercial product in 1922. In 1925, Kenjiro Takayanagi demonstrated a CRT television that received images with a 40-line resolution. By 1927, he improved the resolution to 100 lines, which was unrivaled until 1931. By 1928, he was the first to transmit human faces in half-tones on a CRT display. By 1935, he had invented an early all-electronic CRT television. It was named in 1929 by inventor Vladimir K. Zworykin, who was influenced by Takayanagi's earlier work. RCA was granted a trademark for the term (for its cathode-ray tube) in 1932; it voluntarily released the term to the public domain in 1950. The first commercially made electronic television sets with cathode-ray tubes were manufactured by Telefunken in Germany in 1934. Flat panel displays dropped in price and started significantly displacing cathode-ray tubes in the 2000s, with LCD screens exceeding CRTs in 2008. The last known manufacturer of (in this case, recycled) CRTs ceased in 2015. In oscilloscope CRTs, electrostatic deflection is used, rather than the magnetic deflection commonly used with television and other large CRTs. The beam is deflected horizontally by applying an electric field between a pair of plates to its left and right, and vertically by applying an electric field to plates above and below. Televisions use magnetic rather than electrostatic deflection because the deflection plates obstruct the beam when the deflection angle is as large as is required for tubes that are relatively short for their size. Various phosphors are available depending upon the needs of the measurement or display application. The brightness, color, and persistence of the illumination depends upon the type of phosphor used on the CRT screen. Phosphors are available with persistences ranging from less than one microsecond to several seconds. For visual observation of brief transient events, a long persistence phosphor may be desirable. For events which are fast and repetitive, or high frequency, a short-persistence phosphor is generally preferable. When displaying fast one-shot events, the electron beam must deflect very quickly, with few electrons impinging on the screen, leading to a faint or invisible image on the display. Oscilloscope CRTs designed for very fast signals can give a brighter display by passing the electron beam through a micro-channel plate just before it reaches the screen. Through the phenomenon of secondary emission, this plate multiplies the number of electrons reaching the phosphor screen, giving a significant improvement in writing rate (brightness) and improved sensitivity and spot size as well. Most oscilloscopes have a graticule as part of the visual display, to facilitate measurements. The graticule may be permanently marked inside the face of the CRT, or it may be a transparent external plate made of glass or acrylic plastic. An internal graticule eliminates parallax error, but cannot be changed to accommodate different types of measurements. Oscilloscopes commonly provide a means for the graticule to be illuminated from the side, which improves its visibility. These are found in analog phosphor storage oscilloscopes. These are distinct from digital storage oscilloscopes which rely on solid state digital memory to store the image. Where a single brief event is monitored by an oscilloscope, such an event will be displayed by a conventional tube only while it actually occurs. The use of a long persistence phosphor may allow the image to be observed after the event, but only for a few seconds at best. This limitation can be overcome by the use of a direct view storage cathode-ray tube (storage tube). A storage tube will continue to display the event after it has occurred until such time as it is erased. A storage tube is similar to a conventional tube except that it is equipped with a metal grid coated with a dielectric layer located immediately behind the phosphor screen. An externally applied voltage to the mesh initially ensures that the whole mesh is at a constant potential. This mesh is constantly exposed to a low velocity electron beam from a 'flood gun' which operates independently of the main gun. This flood gun is not deflected like the main gun but constantly 'illuminates' the whole of the storage mesh. The initial charge on the storage mesh is such as to repel the electrons from the flood gun which are prevented from striking the phosphor screen. When the main electron gun writes an image to the screen, the energy in the main beam is sufficient to create a 'potential relief' on the storage mesh. The areas where this relief is created no longer repel the electrons from the flood gun which now pass through the mesh and illuminate the phosphor screen. Consequently, the image that was briefly traced out by the main gun continues to be displayed after it has occurred. The image can be 'erased' by resupplying the external voltage to the mesh restoring its constant potential. The time for which the image can be displayed was limited because, in practice, the flood gun slowly neutralises the charge on the storage mesh. One way of allowing the image to be retained for longer is temporarily to turn off the flood gun. It is then possible for the image to be retained for several days. The majority of storage tubes allow for a lower voltage to be applied to the storage mesh which slowly restores the initial charge state. By varying this voltage a variable persistence is obtained. Turning off the flood gun and the voltage supply to the storage mesh allows such a tube to operate as a conventional oscilloscope tube. The Williams tube or Williams-Kilburn tube was a cathode-ray tube used to electronically store binary data. It was used in computers of the 1940s as a random-access digital storage device. In contrast to other CRTs in this article, the Williams tube was not a display device, and in fact could not be viewed since a metal plate covered its screen. Color tubes use three different phosphors which emit red, green, and blue light respectively. They are packed together in stripes (as in aperture grille designs) or clusters called "triads" (as in shadow mask CRTs). Color CRTs have three electron guns, one for each primary color, arranged either in a straight line or in an equilateral triangular configuration (the guns are usually constructed as a single unit). (The triangular configuration is often called "delta-gun", based on its relation to the shape of the Greek letter delta Δ.) A grille or mask absorbs the electrons that would otherwise hit the wrong phosphor. A shadow mask tube uses a metal plate with tiny holes, placed so that the electron beam only illuminates the correct phosphors on the face of the tube; the holes are tapered so that the electrons that strike the inside of any hole will be reflected back, if they are not absorbed (e.g. due to local charge accumulation), instead of bouncing through the hole to strike a random (wrong) spot on the screen. Another type of color CRT uses an aperture grille of tensioned vertical wires to achieve the same result. 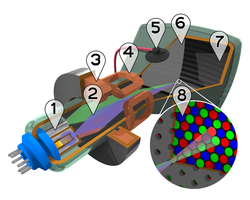 Due to limitations in the dimensional precision with which CRTs can be manufactured economically, it has not been practically possible to build color CRTs in which three electron beams could be aligned to hit phosphors of respective color in acceptable coordination, solely on the basis of the geometric configuration of the electron gun axes and gun aperture positions, shadow mask apertures, etc. The shadow mask ensures that one beam will only hit spots of certain colors of phosphors, but minute variations in physical alignment of the internal parts among individual CRTs will cause variations in the exact alignment of the beams through the shadow mask, allowing some electrons from, for example, the red beam to hit, say, blue phosphors, unless some individual compensation is made for the variance among individual tubes. Color convergence and color purity are two aspects of this single problem. Firstly, for correct color rendering it is necessary that regardless of where the beams are deflected on the screen, all three hit the same spot (and nominally pass through the same hole or slot) on the shadow mask. This is called convergence. More specifically, the convergence at the center of the screen (with no deflection field applied by the yoke) is called static convergence, and the convergence over the rest of the screen area is called dynamic convergence. The beams may converge at the center of the screen and yet stray from each other as they are deflected toward the edges; such a CRT would be said to have good static convergence but poor dynamic convergence. Secondly, each beam must only strike the phosphors of the color it is intended to strike and no others. This is called purity. Like convergence, there is static purity and dynamic purity, with the same meanings of "static" and "dynamic" as for convergence. Convergence and purity are distinct parameters; a CRT could have good purity but poor convergence, or vice versa. Poor convergence causes color "shadows" or "ghosts" along displayed edges and contours, as if the image on the screen were intaglio printed with poor registration. Poor purity causes objects on the screen to appear off-color while their edges remain sharp. Purity and convergence problems can occur at the same time, in the same or different areas of the screen or both over the whole screen, and either uniformly or to greater or lesser degrees over different parts of the screen. The solution to the static convergence and purity problems is a set of color alignment magnets installed around the neck of the CRT. These movable weak permanent magnets are usually mounted on the back end of the deflection yoke assembly and are set at the factory to compensate for any static purity and convergence errors that are intrinsic to the unadjusted tube. Typically there are two or three pairs of two magnets in the form of rings made of plastic impregnated with a magnetic material, with their magnetic fields parallel to the planes of the magnets, which are perpendicular to the electron gun axes. Each pair of magnetic rings forms a single effective magnet whose field vector can be fully and freely adjusted (in both direction and magnitude). By rotating a pair of magnets relative to each other, their relative field alignment can be varied, adjusting the effective field strength of the pair. (As they rotate relative to each other, each magnet's field can be considered to have two opposing components at right angles, and these four components [two each for two magnets] form two pairs, one pair reinforcing each other and the other pair opposing and canceling each other. Rotating away from alignment, the magnets' mutually reinforcing field components decrease as they are traded for increasing opposed, mutually cancelling components.) By rotating a pair of magnets together, preserving the relative angle between them, the direction of their collective magnetic field can be varied. Overall, adjusting all of the convergence/purity magnets allows a finely tuned slight electron beam deflection or lateral offset to be applied, which compensates for minor static convergence and purity errors intrinsic to the uncalibrated tube. Once set, these magnets are usually glued in place, but normally they can be freed and readjusted in the field (e.g. by a TV repair shop) if necessary. On some CRTs, additional fixed adjustable magnets are added for dynamic convergence or dynamic purity at specific points on the screen, typically near the corners or edges. Further adjustment of dynamic convergence and purity typically cannot be done passively, but requires active compensation circuits. Dynamic color convergence and purity are one of the main reasons why until late in their history, CRTs were long-necked (deep) and had biaxially curved faces; these geometric design characteristics are necessary for intrinsic passive dynamic color convergence and purity. Only starting around the 1990s did sophisticated active dynamic convergence compensation circuits become available that made short-necked and flat-faced CRTs workable. These active compensation circuits use the deflection yoke to finely adjust beam deflection according to the beam target location. The same techniques (and major circuit components) also make possible the adjustment of display image rotation, skew, and other complex raster geometry parameters through electronics under user control. If the shadow mask or aperture grille becomes magnetized, its magnetic field alters the paths of the electron beams. This causes errors of "color purity" as the electrons no longer follow only their intended paths, and some will hit some phosphors of colors other than the one intended. For example, some electrons from the red beam may hit blue or green phosphors, imposing a magenta or yellow tint to parts of the image that are supposed to be pure red. (This effect is localized to a specific area of the screen if the magnetization is localized.) Therefore, it is important that the shadow mask or aperture grille not be magnetized. Most color CRT displays, i.e. 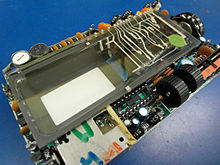 television sets and computer monitors, each have a built-in degaussing (demagnetizing) circuit, the primary component of which is a degaussing coil which is mounted around the perimeter of the CRT face inside the bezel. Upon power-up of the CRT display, the degaussing circuit produces a brief, alternating current through the degaussing coil which smoothly decays in strength (fades out) to zero over a period of a few seconds, producing a decaying alternating magnetic field from the coil. This degaussing field is strong enough to remove shadow mask magnetization in most cases. In unusual cases of strong magnetization where the internal degaussing field is not sufficient, the shadow mask may be degaussed externally with a stronger portable degausser or demagnetizer. However, an excessively strong magnetic field, whether alternating or constant, may mechanically deform (bend) the shadow mask, causing a permanent color distortion on the display which looks very similar to a magnetization effect. The degaussing circuit is often built of a thermo-electric (not electronic) device containing a small ceramic heating element and a positive thermal coefficient (PTC) resistor, connected directly to the switched AC power line with the resistor in series with the degaussing coil. When the power is switched on, the heating element heats the PTC resistor, increasing its resistance to a point where degaussing current is minimal, but not actually zero. In older CRT displays, this low-level current (which produces no significant degaussing field) is sustained along with the action of the heating element as long as the display remains switched on. To repeat a degaussing cycle, the CRT display must be switched off and left off for at least several seconds to reset the degaussing circuit by allowing the PTC resistor to cool to the ambient temperature; switching the display-off and immediately back on will result in a weak degaussing cycle or effectively no degaussing cycle. This simple design is effective and cheap to build, but it wastes some power continuously. Later models, especially Energy Star rated ones, use a relay to switch the entire degaussing circuit on and off, so that the degaussing circuit uses energy only when it is functionally active and needed. The relay design also enables degaussing on user demand through the unit's front panel controls, without switching the unit off and on again. This relay can often be heard clicking off at the end of the degaussing cycle a few seconds after the monitor is turned on, and on and off during a manually initiated degaussing cycle. Vector monitors were used in early computer aided design systems and are in some late-1970s to mid-1980s arcade games such as Asteroids. They draw graphics point-to-point, rather than scanning a raster. Either monochrome or color CRTs can be used in vector displays, and the essential principles of CRT design and operation are the same for either type of display; the main difference is in the beam deflection patterns and circuits. 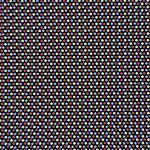 Dot pitch defines the maximum resolution of the display, assuming delta-gun CRTs. In these, as the scanned resolution approaches the dot pitch resolution, moiré appears, as the detail being displayed is finer than what the shadow mask can render. Aperture grille monitors do not suffer from vertical moiré; however, because their phosphor stripes have no vertical detail. In smaller CRTs, these strips maintain position by themselves, but larger aperture-grille CRTs require one or two crosswise (horizontal) support strips. CRTs have a pronounced triode characteristic, which results in significant gamma (a nonlinear relationship in an electron gun between applied video voltage and beam intensity). In some vacuum tube radio sets, a "Magic Eye" or "Tuning Eye" tube was provided to assist in tuning the receiver. Tuning would be adjusted until the width of a radial shadow was minimized. This was used instead of a more expensive electromechanical meter, which later came to be used on higher-end tuners when transistor sets lacked the high voltage required to drive the device. 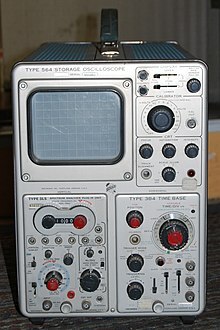 The same type of device was used with tape recorders as a recording level meter, and for various other applications including electrical test equipment. Some displays for early computers (those that needed to display more text than was practical using vectors, or that required high speed for photographic output) used Charactron CRTs. These incorporate a perforated metal character mask (stencil), which shapes a wide electron beam to form a character on the screen. The system selects a character on the mask using one set of deflection circuits, but that causes the extruded beam to be aimed off-axis, so a second set of deflection plates has to re-aim the beam so it is headed toward the center of the screen. A third set of plates places the character wherever required. The beam is unblanked (turned on) briefly to draw the character at that position. Graphics could be drawn by selecting the position on the mask corresponding to the code for a space (in practice, they were simply not drawn), which had a small round hole in the center; this effectively disabled the character mask, and the system reverted to regular vector behavior. Charactrons had exceptionally long necks, because of the need for three deflection systems. Nimo was the trademark of a family of small specialised CRTs manufactured by Industrial Electronics Engineers. These had 10 electron guns which produced electron beams in the form of digits in a manner similar to that of the charactron. The tubes were either simple single-digit displays or more complex 4- or 6- digit displays produced by means of a suitable magnetic deflection system. 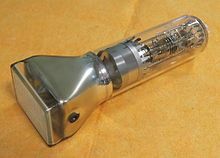 Having little of the complexities of a standard CRT, the tube required a relatively simple driving circuit, and as the image was projected on the glass face, it provided a much wider viewing angle than competitive types (e.g., nixie tubes). Flood beam CRTs are small tubes that are arranged as pixels for large screens like Jumbotrons. The first screen using this technology was introduced by Mitsubishi Electric for the 1980 Major League Baseball All-Star Game. It differs from a normal CRT in that the electron gun within does not produce a focused controllable beam. Instead, electrons are sprayed in a wide cone across the entire front of the phosphor screen, basically making each unit act as a single light bulb. Each one is coated with a red, green or blue phosphor, to make up the color sub-pixels. This technology has largely been replaced with light emitting diode displays. Unfocused and undeflected CRTs were used as grid-controlled stroboscope lamps since 1958. CRTs with an unphosphored front glass but with fine wires embedded in it were used as electrostatic print heads in the 1960s. The wires would pass the electron beam current through the glass onto a sheet of paper where the desired content was therefore deposited as an electrical charge pattern. The paper was then passed near a pool of liquid ink with the opposite charge. The charged areas of the paper attract the ink and thus form the image. In the late 1990s and early 2000s Philips Research Laboratories experimented with a type of thin CRT known as the Zeus display which contained CRT-like functionality in a flat panel display. The devices were demonstrated but never marketed. Some CRT manufacturers, both LG Display and Samsung Display, innovated CRT technology by creating a slimmer tube. Slimmer CRT has a trade name Superslim and Ultraslim. A 21-inch (53 cm) flat CRT has a 447.2-millimetre (17.61 in) depth. The depth of Superslim was 352 millimetres (13.86 in) and Ultraslim was 295.7 millimetres (11.64 in). Despite being a mainstay of display technology for decades, CRT-based computer monitors and televisions are now virtually a dead technology. Demand for CRT screens dropped in the late 2000s. The rapid advances and falling prices of LCD flat panel technology -- first for computer monitors, and then for televisions -- spelled doom for competing display technologies such as CRT, rear-projection, and plasma display. Most high-end CRT production had ceased by around 2010, including high-end Sony and Panasonic product lines. In Canada and the United States, the sale and production of high-end CRT TVs (30-inch (76 cm) screens) in these markets had all but ended by 2007. Just a couple of years later, inexpensive "combo" CRT TVs (20-inch (51 cm) screens with an integrated VHS player) disappeared from discount stores. Electronics retailers such as Best Buy steadily reduced store spaces for CRTs. In 2005, Sony announced that they would stop the production of CRT computer displays. Samsung did not introduce any CRT models for the 2008 model year at the 2008 Consumer Electronics Show; on 4 February 2008, they removed their 30" wide screen CRTs from their North American website and did not replace them with new models. In the United Kingdom, DSG (Dixons), the largest retailer of domestic electronic equipment, reported that CRT models made up 80–90% of the volume of televisions sold at Christmas 2004 and 15–20% a year later, and that they were expected to be less than 5% at the end of 2006. Dixons ceased selling CRT televisions in 2006. However, the demise of CRTs has been happening more slowly in the developing world. According to iSupply, production in units of CRTs was not surpassed by LCDs production until 4Q 2007, owing largely to CRT production at factories in China. CRTs, despite advances, remained relatively heavy and cumbersome in comparison to other display technologies. CRT screens had much deeper cabinets compared to flat panels and rear-projection displays for a given screen size; it was largely impractical to build or use CRTs larger than 40 inches (102 cm). The CRT disadvantages became especially significant in light of rapid technological advancements in LCD and plasma flat-panels, which allowed them to easily surpass these size limitations while also being thin and wall-mountable (two key features that were increasingly being preferred by customers). Older color and monochrome CRTs may have been manufactured with toxic substances, such as cadmium, in the phosphors. The rear glass tube of modern CRTs may be made from leaded glass, which represent an environmental hazard if disposed of improperly. By the time personal computers were produced, glass in the front panel (the viewable portion of the CRT) used barium rather than lead, though the rear of the CRT was still produced from leaded glass. Monochrome CRTs typically do not contain enough leaded glass to fail EPA TCLP tests. While the TCLP process grinds the glass into fine particles in order to expose them to weak acids to test for leachate, intact CRT glass does not leach (The lead is vitrified, contained inside the glass itself, similar to leaded glass crystalware). Due to the toxins contained in CRT monitors the United States Environmental Protection Agency created rules (in October 2001) stating that CRTs must be brought to special e-waste recycling facilities. In November 2002, the EPA began fining companies that disposed of CRTs through landfills or incineration. Regulatory agencies, local and statewide, monitor the disposal of CRTs and other computer equipment. Various states participate in the recycling of CRTs, each with their reporting requirements for collectors and recycling facilities. For example, in California the recycling of CRTs is governed by CALRecycle, the California Department of Resources Recycling and Recovery through their Payment System. . Recycling facilities that accept CRT devices from business and residential sector must obtain contact information such as address and phone number to ensure the CRTs come from a California source in order to participate in the CRT Recycling Payment System. In Europe, disposal of CRT televisions and monitors is covered by the WEEE Directive. At low refresh rates (60 Hz and below), the periodic scanning of the display may produce a flicker that some people perceive more easily than others, especially when viewed with peripheral vision. Flicker is commonly associated with CRT as most televisions run at 50 Hz (PAL) or 60 Hz (NTSC), although there are some 100 Hz PAL televisions that are flicker-free. Typically only low-end monitors run at such low frequencies, with most computer monitors supporting at least 75 Hz and high-end monitors capable of 100 Hz or more to eliminate any perception of flicker. Though the 100 Hz PAL was often achieved using interleaved scanning, dividing the circuit and scan into two beams of 50 Hz. Non-computer CRTs or CRT for sonar or radar may have long persistence phosphor and are thus flicker free. If the persistence is too long on a video display, moving images will be blurred. 50 Hz/60 Hz CRTs used for television operate with horizontal scanning frequencies of 15,750 Hz (for NTSC systems) or 15,625 Hz (for PAL systems). These frequencies are at the upper range of human hearing and are inaudible to many people; however, some people (especially children) will perceive a high-pitched tone near an operating television CRT. The sound is due to magnetostriction in the magnetic core and periodic movement of windings of the flyback transformer. This problem does not occur on 100/120 Hz TVs and on non-CGA (Color Graphics Adapter) computer displays, because they use much higher horizontal scanning frequencies (22 kHz to over 100 kHz). High vacuum inside glass-walled cathode-ray tubes permits electron beams to fly freely—without colliding into molecules of air or other gas. If the glass is damaged, atmospheric pressure can collapse the vacuum tube into dangerous fragments which accelerate inward and then spray at high speed in all directions. The implosion energy is proportional to the evacuated volume of the CRT. 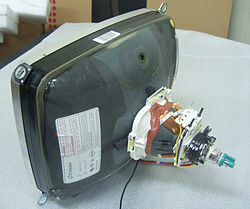 Although modern cathode-ray tubes used in televisions and computer displays have epoxy-bonded face-plates or other measures to prevent shattering of the envelope, CRTs must be handled carefully to avoid personal injury. To accelerate the electrons from the cathode to the screen with sufficient velocity, a very high voltage (EHT or Extra High Tension) is required, from a few thousand volts for a small oscilloscope CRT to tens of kV for a larger screen color TV. This is many times greater than household power supply voltage. Even after the power supply is turned off, some associated capacitors and the CRT itself may retain a charge for some time and therefore dissipate that charge suddenly through a ground such as an inattentive human grounding a capacitor discharge lead. Under some circumstances, the signal radiated from the electron guns, scanning circuitry, and associated wiring of a CRT can be captured remotely and used to reconstruct what is shown on the CRT using a process called Van Eck phreaking. Special TEMPEST shielding can mitigate this effect. Such radiation of a potentially exploitable signal, however, occurs also with other display technologies and with electronics in general. As electronic waste, CRTs are considered one of the hardest types to recycle. CRTs have relatively high concentration of lead and phosphors (not phosphorus), both of which are necessary for the display. There are several companies in the United States that charge a small fee to collect CRTs, then subsidize their labor by selling the harvested copper, wire, and printed circuit boards. The United States Environmental Protection Agency (EPA) includes discarded CRT monitors in its category of "hazardous household waste" but considers CRTs that have been set aside for testing to be commodities if they are not discarded, speculatively accumulated, or left unprotected from weather and other damage. Leaded CRT glass was sold to be remelted into other CRTs, or even broken down and used in road construction. ^ "History of the Cathode Ray Tube". About.com. Retrieved 4 October 2009. ^ a b "'How Computer Monitors Work'". Retrieved 4 October 2009. ^ Ferdinand Braun (1897) "Ueber ein Verfahren zur Demonstration und zum Studium des zeitlichen Verlaufs variabler Ströme" (On a process for the display and study of the course in time of variable currents), Annalen der Physik und Chemie, 3rd series, 60: 552–559. ^ "Cathode Ray Tube". Medical Discoveries. Advameg, Inc. 2007. Retrieved 27 April 2008. ^ "Cathode Ray Tube and its Applications". International Journal of Innovative Research in Technology. 1. ^ Kenjiro Takayanagi: The Father of Japanese Television, NHK (Japan Broadcasting Corporation), 2002, retrieved 2009-05-23. ^ Forrester, Chris (28 August 2011). "High Above: The untold story of Astra, Europe's leading satellite company". Springer Science & Business Media – via Google Books. ^ a b Albert Abramson, Zworykin, Pioneer of Television, University of Illinois Press, 1995, p. 231. ISBN 0-252-02104-5. ^ Albert Abramson, Zworykin, Pioneer of Television, University of Illinois Press, 1995, p. 84. ISBN 0-252-02104-5. ^ "RCA Surrenders Rights to Four Trade-Marks," Radio Age, October 1950, p. 21. ^ Telefunken, Early Electronic TV Gallery, Early Television Foundation. ^ 1934–35 Telefunken, Television History: The First 75 Years. ^ "Saying Goodbye To Old Technology — And A Legendary NYC Repair Shop". ^ Doebelin, Ernest (2003). Measurement Systems. McGraw Hill Professional. p. 972. ISBN 978-0-07-292201-1. ^ Shionoya, Shigeo (1999). Phosphor handbook. CRC Press. p. 499. ISBN 978-0-8493-7560-6. ^ Williams, Jim (1991). Analog circuit design: art, science, and personalities. Newnes. pp. 115–116. ISBN 978-0-7506-9640-1. ^ Yen, William M.; Shionoya, Shigeo; Yamamoto, Hajime (2006). Practical Applications of Phosphors. CRC Press. p. 211. ISBN 978-1-4200-4369-3. ^ Bakshi, U.A. ; Godse, A.P. (2008). Electronic Devices And Circuits. Technical Publications. p. 38. ISBN 978-81-8431-332-1. ^ Hickman, Ian (2001). 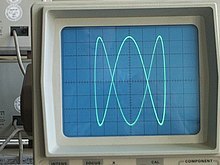 Oscilloscopes: how to use them, how they work. Newnes. p. 47. ISBN 978-0-7506-4757-1. ^ a b "How CRT and LCD monitors work". bit-tech.net. Retrieved 4 October 2009. ^ a b "The Shadow Mask and Aperture Grill". PC Guide. ^ Norton, Thomas J. (March 2005). "Picture This". UltimateAVmag.com. Archived from the original on 26 November 2009. ^ "Magnetization and Degaussing". Retrieved 4 October 2009. ^ Van Burnham (2001). Supercade: A Visual History of the Videogame Age, 1971–1984. MIT Press. ISBN 0-262-52420-1. ^ "Moiré Interference Patterns". DisplayMate Technologies website. Retrieved 4 October 2006. ^ "What causes the faint horizontal lines on my monitor?". HowStuffWorks. Retrieved 4 October 2009. ^ Robin, Michael (1 January 2005). "Gamma correction". BroadcastEngineering. Archived from the original on 31 May 2009. Retrieved 4 October 2009. ^ "Tuning-Eye Tubes". vacuumtube.com. Archived from the original on 23 April 2009. Retrieved 1 December 2009. ^ "Cathode ray apparatus". Retrieved 4 October 2009. ^ "INPUT". Retrieved 4 October 2009. ^ "IEE Nimo CRT 10-gun readout tube datasheet" (PDF). tube-tester.com. Retrieved 1 December 2009. ^ "Futaba TL-3508XA 'Jumbotron' Display". The Vintage Technology Association: Military Industrial Electronics Research Preservation. The Vintage Technology Association. 11 March 2010. Retrieved 19 December 2014. ^ "Vacuum light sources — High speed stroboscopic light sources data sheet" (PDF). Ferranti, Ltd. August 1958. Retrieved 7 May 2017. ^ "CK1366 CK1367 Printer-type cathode ray tube data sheet" (PDF). Raytheon Company. 1 November 1960. Retrieved 29 July 2017. ^ "CK1368 CK1369 Printer-type cathode ray tube data sheet" (PDF). Raytheon Company. 1 November 1960. Retrieved 29 July 2017. ^ Beeteson, John Stuart (21 November 1998). "US Patent 6246165 – Magnetic channel cathode". Archived from the original on 18 May 2013. ^ Van Hal; Henricus A. M.; et al. (18 May 1990). "US Patent 5905336 – Method of manufacturing a glass substrate coated with a metal oxide". ^ Van Gorkom, G.G.P. (1996). "Introduction to Zeus displays". Philips Journal of Research. 50 (3–4): 269. doi:10.1016/S0165-5817(97)84675-X. ^ Lambert, N.; Montie, E.A. ; Baller, T.S. ; Van Gorkom, G.G.P. ; Hendriks, B.H.W. ; Trompenaars, P.H.F. ; De Zwart, S.T. (1996). "Transport and extraction in Zeus displays". Philips Journal of Research. 50 (3–4): 295. doi:10.1016/S0165-5817(97)84677-3. ^ Doyle, T.; Van Asma, C.; McCormack, J.; De Greef, D.; Haighton, V.; Heijnen, P.; Looymans, M.; Van Velzen, J. (1996). "The application and system aspects of the Zeus display". Philips Journal of Research. 50 (3–4): 501. doi:10.1016/S0165-5817(97)84688-8. ^ Wong, May (22 October 2006). "Flat Panels Drive Old TVs From Market". AP via USA Today. Retrieved 8 October 2006. ^ "The Standard TV" (PDF). Veritas et Visus. Retrieved 12 June 2008. ^ "End of an era". The San Diego Union-Tribune. 20 January 2006. Retrieved 12 June 2008. ^ "Matsushita says good-bye to CRTs". engadgetHD. 1 December 2005. Archived from the original on 14 January 2009. Retrieved 12 June 2008. ^ "SlimFit HDTV". Samsung. Archived from the original on 10 January 2008. Retrieved 12 June 2008. ^ "Subchapter J, Radiological Health (21CFR1020.10)". U.S. Food and Drug Administration. 1 April 2006. Retrieved 13 August 2007. ^ "Toxic TVs". Electronics TakeBack Coalition. Archived from the original on 27 February 2009. Retrieved 13 April 2010. ^ Peters-Michaud, Neil; Katers, John; Barry, Jim. "Occupational Risks Associated with Electronics Demanufacturing and CRT Glass Processing Operations and the Impact of Mitigation Activities on Employee Safety and Health" (PDF). Cascade Asset Management, LLC. Basel Action Network. Archived from the original (PDF) on 26 July 2011. Retrieved 20 January 2011. ^ "Cadmium". American Elements. Retrieved 13 April 2010. ^ "Characterization of Lead Leachability from Cathode Ray Tubes Using the Toxicity Characteristic Leaching Procedure" (PDF). Archived from the original (PDF) on 22 February 2014. Retrieved 4 October 2009. ^ "Final Rules on Cathode Ray Tubes and Discarded Mercury-Containing Equipment". Retrieved 4 October 2009. ^ California, State of. "Covered Electronic Waste Payment System". www.calrecycle.ca.gov. ^ "WEEE and CRT Processing". Archived from the original on 3 June 2009. Retrieved 4 October 2009. ^ "CRT Monitor Flickering?". Archived from the original on 15 May 2016. Retrieved 4 October 2009. ^ Netravali, Arun N.; Haskell, Barry G. (1995). Digital pictures: representation, compression, and standards. Plenum Publishing Corporation. p. 100. ISBN 978-0-306-44917-8. ^ "The monitor is producing a high-pitched whine". Retrieved 4 October 2009. ^ Rhys-Jones, J. (February 1951). "Television economics". Radiotronics. 16 (2): 37. ^ Bali, S.P. (1994). Colour Television: Theory and Practice. Tata McGraw–Hill. p. 129. ISBN 978-0-07-460024-5. ^ "Electromagnetic Radiation from Video Display Units: An Eavesdropping Risk?" (PDF). Retrieved 4 October 2009. ^ Kuhn, M.G. (2004). "Electromagnetic Eavesdropping Risks of Flat-Panel Displays" (PDF). 4th Workshop on Privacy Enhancing Technologies: 23–25. ^ WEEE: CRT and Monitor Recycling. Executiveblueprints.com (2 August 2009). Retrieved on 26 August 2013. ^ Morgan, Russell (21 August 2006). "Tips and Tricks for Recycling Old Computers". SmartBiz. Retrieved 17 March 2009. 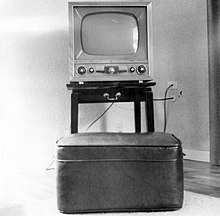 Wikimedia Commons has media related to Cathode ray tube.